I've published a new website with CSB, but I can't see the links to the different pages, ie. Home, Services, About Me, Contact. I saw them when my page was published with a black background, but now that I redid it in white, I only see the title of the page I'm on. I do see all the page links when working in CSB, but not the finished pages. I've even changed fonts and font colors without success. I can see them... either with Firefox or Internet Explorer. I can see you are using CSB4 and that you are using a standard template. You will have to roll back to default on the template to fix the issue. Should not be difficult, especially at the beginning of building. Tony this is what I see when I go to the site: white links on white page. Make sure you make backup of the TLX design file that CSB uses to build the site! You NEED this file to edit your website files with that piece of software. If you lose that file or it becomes corrupted, you can not edit the site with that software again until you rebuild the file from scratch!!! Always best to create a backup before you do any major change to the site. LOW TECH way: Use FILE SAVE AS every time you open your file. Save the file with a name that includes the date for easiest reference and the files stay in date order too! Example: open main010109 FILE SAVE AS main010209. The next save as: main010309. Subdirectory examples: vacation070109, photos070109 etc. Simple. Fast. Easy. The publishing information remains the same and is undisturbed. The previous day's file still exists so you can come back to it if necessary and this process creates an unlimited number of backup copies you can delete or archive the old ones as you see fit, or have a record of how your site has progressed. This technique will also keep you from overwriting your existing file with an older version!!! It appears that the STATIC TEXT in the TOP BORDER has been unlocked and manually modified. On all CSB templates there are LOCKED STATIC TEXT areas. Usually the borders were built with menus, links, titles, custom fields, etc that need specific features and to protect them, CSB has them locked. You can modify just a page by right clicking the border area and choosing the Unlock Static Text to put something into just that page uniquely but I usually do NOT recommend changing the text or link colors this way. There is a BETTER way, faster way to make GLOBAL changes. FIRST, lets fix your issue. Make a backup copy of your TLX file before we begin! You should be able to put the DEFAULT page layout back. 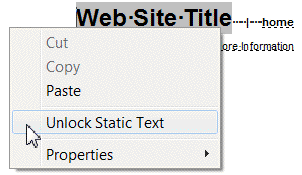 If you unlocked the static text area of your page, you will get a WARNING that your changes will be lost. Refresh your page, and you might need to clear your temporary internet files to see the changes. If not, you will need to edit to put the settings back to normal. In CSB 4: Set your Link and Visited Link colors. Do not use white for either. (Note re: CSB4 Rollover feature: can be finicky! Sometimes it works, sometimes it takes tweaking! DO NOT change the Link and Visited link colors if you are planning to use rollover highlighting - sometimes interfers (not always). 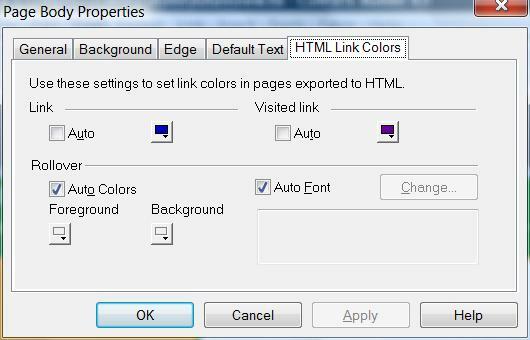 In CSB 5: Set your link colors any way you want! Much better options that work WELL. Click FINISHED to exit the Page Layout editing. Now you need to apply that Page Layout again. This time you should not get any warnings since all your pages have static text again. Try NOT to unlock any static text areas of the layout on your individual pages. This BREAKS the automatic features. If you need to add something special to the top or left, that is not on the layout, create a NEW layout and add it to the new layout. Apply that layout to the page. That way if you ever need to adjust the format globally, you can, easily and quickly. All pages that have a particular layout immediately change. Keeps the global settings clean. 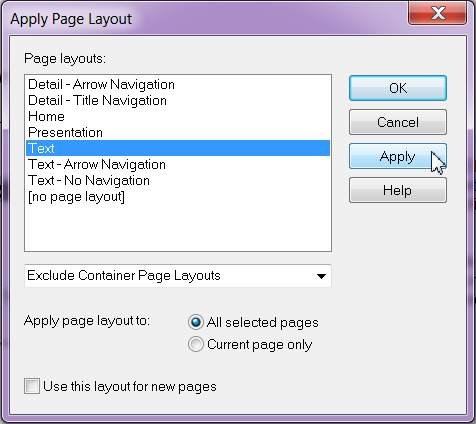 Then make all the changes you want on that page layout. Then Apply that page layout to any page. Your page will automatically adjust. Or for holiday changes, etc. Quick change to many pages or just to one. Yep. Go to the other pages Tony. You are on the HOME page. The links on home are on left. Links for other pages are across top. Red arrow looks like it came from FastStone Capture. Did it? Yea, I didn't go further Home page... sorry. Yes, FastStone is one of the most amazing Image Viewer I've used so far. You folks, especially Sam, are awesome! I don't know how you know all these little things in CSB, but you do. I went through the step by step instructions, and easy corrected the problem (using CSB4). Thanks again, and thanks Sam for hosting this site. I just noticed that when I go to the About Me page, I've got some weird stuff happening on the upper left... it gives an additional link to Home, and says "Home" twice, even though it's the About Me page. Any quick resolution here? I think that's why I unlocked the text before just to get rid of these things. I even made it white font at one point. YAY!!! Glad to be of help! I really enjoy doing it. On the FIELDS tab, Change the TITLE to the Name of your website. 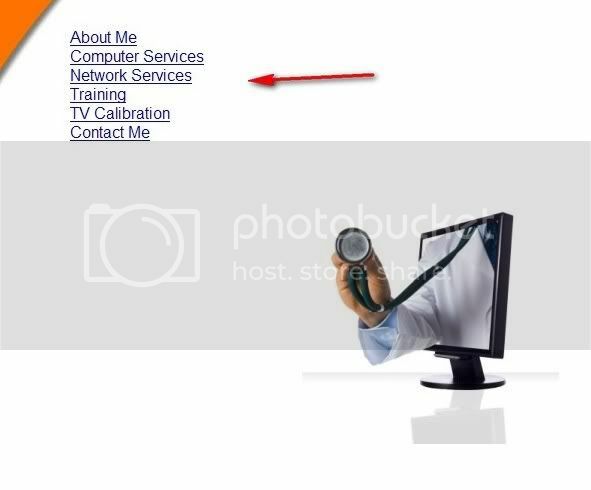 Then when you publish site, you will see Puter Doctor / home. Try not to unlock. Makes things easier and better for updates and corrections. Remove the TITLE field from the top of the page. Click FORMAT > APPLY PAGE LAYOUT and apply your NEW layout to any page that you don't want to have the title. Yes Tony I LOVE that program! and the fact it is portable (put on usb stick) and not install it! Did you know you can drag a pic onto the capture toolbar and it will open in the editor? Great to add a caption quickly to existing image! I changed the title in the Fields tab, but still have that double mess in the top right of the About Me page. Ok, please disregard... I just highlighted the lower title bar and links, hit CUT and it disappeared. Good luck with the business. Like what you are offering and hope you do well. Yes, I figure some people might call extra, but that is my way to get business, since I figure it's something most support places aren't doing. Plus I figure it will get me in the door of places when I can't resolve their problem quickly over the phone. And if I can, then perhaps they'll tell friends. I will look at it again and might change the wording though. Thanks again for past support, too! You are the Pro for computer support. I am just a nerd. And thoroughly enjoy helping folks. I don't offer the same service that you do, but we do have some things in common. Take a look at my http://www.aWebWench.com site. Too wordy, but hey...that's me. No, I wouldn't say I'm a pro for support. There's just too much to know, and no way to keep up! You have similar qualifications as me; we're similar in what we do. Now if we could only make that pay good money we'd have it made. I removed the free phone support and posting the prices as per someone that's helping me get things going. I did post a minimum fee for on-site support. I got to thinking about the idea that people want a basic cost before they contact. But said that phone and online support would be handled with a quote based on time and subject. (Have done that for years). Have been making animated gif and flash ads for my site. And making more mods too. Took off my "stylized" dragonfly and put in a more traditional version for main graphic. I like the clean look of your site. Simple, Clean more "tech" looking than mine, but since I am also trying to sell my graphic work I need more dressing. Have you considered using a FORM on your site? http://www.EmailMeForm.com is FREE for up to 200 submissions per month and has really become a nice service. I may remove the form I have on samisite.com and replace it with an EMF since I am so pleased with the service on other sites. Since our sites have similar support services, and are on opposite ends of the continent, if you would like to have a link share between the sites, I would be willing to do that. Help both our rankings to have decent incoming links from similar sites and will not hurt business. Let me know if you are interested. I will check out the forms, but so far, no business from the website yet! The hard part is getting the word out. I'd be willing to do up a link page with your site if you think it might do some good. I was just at a marketing place that does web design, and they looked at my site, noting that there weren't many keywords/tags to optimize search engines. How can I add more (I placed test in white font in case that would help), or is this for another thread? I didn't find anything when I searched Samisite. We could continue our discussion via email if you wish. Whoops, I searched again and found how to change/add keywords. Each page needs keywords. And a good page "summary" description too. http://www.samisite.com/publish/pageproperties.htm The description shows up on the search engine response. It must accurately describe the page and start out with a short sentence that GRABS the interest of the potential visitor. Take a look at this page for some more basic search engine info. Remember site rankings are flexible! They can bend but also break! Feed the HUMAN and the COMPUTER visitor. TEXT content is vital for search engines and you have it. The keywords need to be in the text of the page too. Hiding text by changing color is frowned on by the search engines and can cause a backlash. Don't do it. My iframes web page is #5 out of 30,200,000 options this morning on GOOGLE. (Search "iframes" on Google) Built in the OLD CSB, it still ranks well because of keywords, description, content AND TONS of incoming links. Websites are not islands. They must not be isolated. They MUST have incoming links. Those roads from similar sites, similar content are VITAL to having visitors. The more incoming links coming to those pages, the more traffic. Will your website be an island, only known by you? or in backwoods with a dirt road with limited access, or have a super highway carrying many lanes of traffic to you? Get links from community sites, etc to start building the road to your site. Links from similar content, discussion or from highly ranked sites are given more importance and make your site more relevent. Flash is fun for the human eye but does NOTHING for the search engines. Flash is fine as long as you have the same content available on the page in text form some how. And do NOT use a splash page to enter your site. Staying on the forum allows others to learn from this too. I will put a little text link on the bottom of my tutor page. If you want to use it, just RIGHT CLICK to save it to your own computer. Then you can put it on your own or other websites as you wish. Page created in 0.303 seconds with 26 queries.